Tim Cameron teaches about food and culture at Johnson & Wales University in Charlotte. Does Tim Cameron have one of the best jobs in Charlotte? 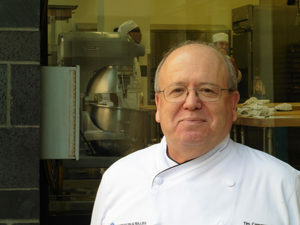 He teaches about international cuisines and cultures at Johnson & Wales University. Last time I ran into him, he was talking about a workshop in Napa Valley where he’d hobnobbed with noted Peruvian chefs. Poor guy. Let’s put that learning to work, I said. So we headed to La Cancha, 11329 E. Independence Boulevard. What would he find at Charlotte’s newest Peruvian restaurant? He skipped the Mexican-style chips and salsa, instead starting with a distinctively Peruvian appetizer called Cancha. It’s corn kernels, toasted so they crisp and burst open. Corn is big throughout Peruvian cuisine, dating back to ancient civilization. We made sure to order Chicha Morada, Peru’s signature sweet, cold drink made with pineapple juice, corn and cinnamon. 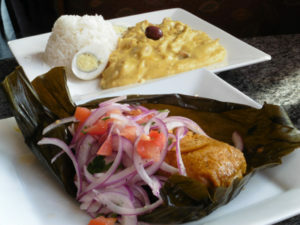 A Peruvian tamale and a plate of Aji Gallina at La Cancha. Let’s get something from Peru’s two best-known culinary zones, the coast and the mountains, Cameron suggested. From the coast he ordered Parihuela, a seafood soup with tilapia, scallops, mussels and squid in a complexly flavored tomato broth. “Tastes like it’s right out of Spain,” he exclaimed. I tucked into a plate of Aji de Gallina, a hearty dish perfect for a cold mountain day. Potatoes and shredded chicken hide under a yellow cream sauce. Peru’s favorite yellow aji amarillo peppers give it the color … and a flavor that’s bright but not insistently spicy. Soon Cameron was chatting up chef Dulio Macchiavello, a native of Lima, Peru, who has cooked at several top-line Charlotte-area restaurants from Cantina 1511 to the recently-closed Peruvian eatery Genaros. Cameron and Chef Dulio talked about the challenges of sourcing traditional ingredients as they sampled a Peruvian tamale, stuffed with shredded chicken and hard-boiled egg in a smoky-flavored masa (corn dough) colored with aji panca peppers. Does the restaurant name La Cancha honor Peruvian corn, I asked? No, laughed Chef Dulio. It’s also a nickname for a soccer field — which is where he first met Melida Amaya, who owns the restaurant. 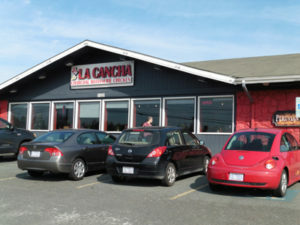 La Cancha is located on Independence Boulevard between Highway 51 and Interstate 485. It’s worth poking around the block, one of Charlotte’s most diverse: foodie options range from Russian specialities at Cmak Deli to handmade sausages at the South African Food Shop. 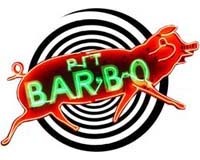 Tuesday – Sunday 11 a.m. – 9 p.m. 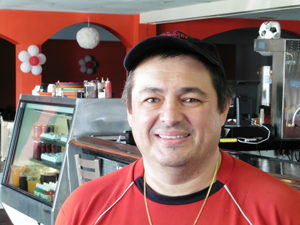 Chef Dulio Macchiavello, born in Lima, Peru, came to La Cancha after building a following at Genaros Peruvian restaurant in Indian Trail. He’s a passionate soccer player who often dresses in soccer clothes. 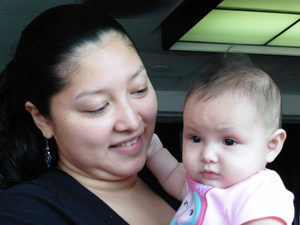 LaCancha’s owner Melida Amaya often brings her daughter to the restaurant.